What is a “folding mobility scooter”? When shopping for mobility scooters, you will find that there are a number of brands that offer “fold up mobility scooters”, “folding scooters” or “foldable mobility scooters”. Compared to traditional power scooters and mobility scooters, a foldable mobility scooter is designed to fold into a more compact shape, or easily disassemble, to make transportation and/or storage more convenient. Within the realm of foldable mobility scooters, there are numerous brands with various features and benefits. These scooters differ greatly brand-to-brand. Some brands offer lightweight foldable mobility scooters with new lithium-ion batteries. Other foldable mobility scooters may use traditional lead-acid batteries. Battery size (which is directly related to the folding scooter travel range) and type are a huge factor in the total weight of a mobility scooter. Understanding the scooter ‘folding’ features, such as quick-disconnect parts and simple controls for folding and reassembly, are key in determining which foldable mobility scooter you choose. Whether you plan on using your folding scooter for travel, grocery shopping or to simply ride around your neighborhood, choosing a scooter that you can both easily fold and pick up can be the difference between a mobility scooter you love and a mobility scooter you wish you hadn’t bought. Beyond weight and folding mechanism, a foldable mobility scooter must be able to perform in the ways your life demands. Just because a fold up scooter is lightweight doesn’t mean it should be for light use. A quality folding mobility scooter has the power and stability. 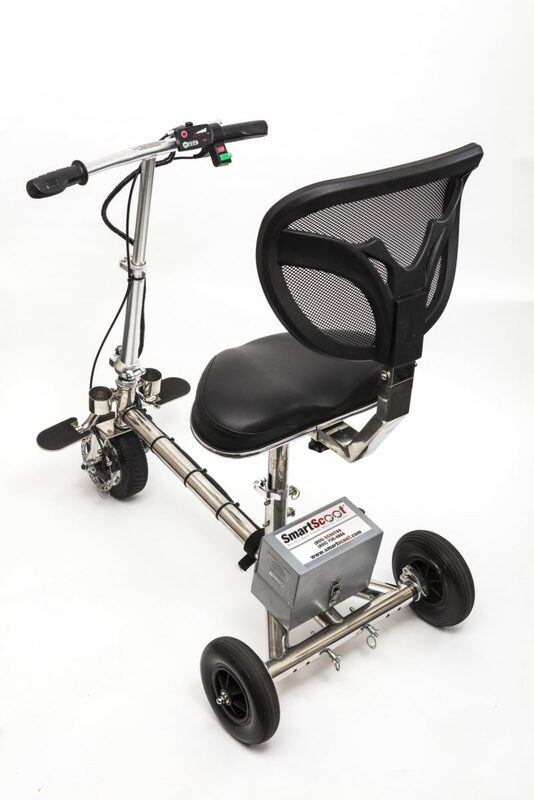 SmartScoot ™ provides a foldable scooter that offers variable rear wheel axle-width for stability, a variable speed control as well as front wheel drive. Variable speed gives you the versatility for various terrain while front wheel drive offers increased safety, power and stability when navigating an incline. Folding mobility scooters answer the needs of people with mobility challenges due to chronic conditions or temporary injury. To determine which foldable scooter is ideal for your needs, make sure to take into account the weight, size, folding mechanism and versatility of the fold up scooters that you consider. Understanding these key attributes will help ensure you make the right decision for your lifestyle and needs. Read more about the SmartScoot ™ in our testimonials section.